The gears, technology, and moving parts that make digital art is what interested Jeremy Garretson. Photography had been a college elective, but that had its own gears, too. It was standing in the middle of the abandoned Pilgrim State Hospital behind the lens of a film camera that first piqued his interest in photography. 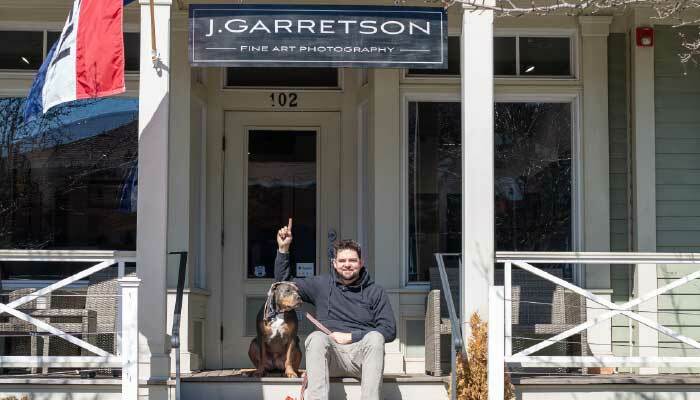 This moment led Garretson to where he stands today, inside his newly opened studio gallery in Greenport, sharing how his subjects grew from abandoned buildings to landscapes and the evolution of his work as an artist. Garretson’s interest and talent developed, but crashed to a halt. His camera and gear were stolen, and he didn’t pick another up for six years. It was a disheartening experience and within that time, he had become depressed and fell into addiction. In the dark of this bad place he met his future wife, event planner Ashley O’Neil, who encouraged him to get back into photography after viewing his old work. She bought him a used Canon 5D Mark II. “I was trying to get clean and had a lot of free time,” Garretson shares, adding with a laugh he had done all the puzzles and coloring books. “I tried to isolate myself and rebuild who I am. The camera gave me purpose. Looking through the view finder gave me the opportunity to tune everything out and just focus on what’s in front of me – “ “It also gave us all of these beautiful landscapes,” O’Neil adds. This was Garretson’s entrée into landscape photography. Coupling his need to be around nature and his technical know-how, he photographed landscapes across the North Fork. What began as therapy transpired into a career, and in 2016 J.G. Photography became a business. Bold and vibrant images captured through Garretson’s lens take hold of the viewer’s attention with even the most minute detail adding interest to his work. His post-processing methods are what completes his images, whether it be the common “dodging and burning” method, or adding vibrancy and contrast, each image is fine tuned to its best representation. There is also an incubation phase Garretson plans to regularly incorporate into his work, allowing him to revisit an image over a period of time, tweaking or even ultimately deleting if it’s not working. Golden Barn #2 is an example of an image benefitting from this method. Garretson got the shot in 2016, edited and published it, and then revisited years later as his skills as an artist had changed significantly. The current production of this photo tells a better story. 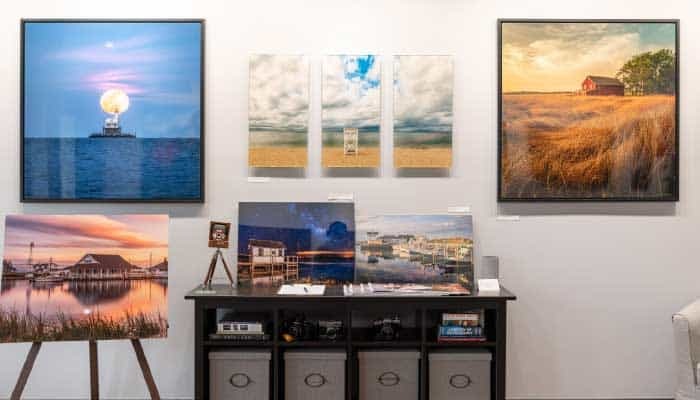 Inspired by early Hudson River School and romantic painters, Garretson understands that he can capture and produce landscape images with the right planning. This is particularly evident in his astrophotography pieces which depict energetic images of illuminated night skies. “Milky Way Over Bug Light” took months to plan, with Garretson out on a boat at 11:30 p.m. He uses a new star tracker method atop his tripod that aims at the North Star and imitates the earth’s rotation, allowing him to take really long exposures and get the shot. Particular in every detail, from editing to paper choice to mounting, Garretson has amassed a collection that has allowed him to open his first studio space where he can display his work together, have the desired lighting, and work on new projects. O’Neil shares the space, allowing the couple to advance their creative ventures together in a community they’re proud to be part of. The studio will be part of Greenport’s monthly gallery walk. Garretson plans to host photography seminars and lectures as well as one-on-one trainings.